Amsterdam WAS supposed to finish off International Week but let’s have just one more. Diane Pucin is a Glen of Imaal Terrier owning writer for the Los Angeles Times. Like all of us she can often get a mention of Glens in somewhere but this must surely be a first for College Football Weekend! Still international but a bit different…. Back in 2004 Glen of Imaal Terriers joined the “full” register of the AKC with Scoobie and India actually gaining their Championships that first weekend. A mere four years later there have been 72 Glen Champions in the States. To many Glen exhibitors in the rest of the world that appears an incredible number; the US is a huge place but WOW! The UK Glens hit “full” status in 2007 with Homer and Daisy being the first two Champions but since then there has only been one other. The first Champion in Germany was Rhett Butler in 1985 and he also had the registration number of 001 but how many Champions have there been since then? Anybody know the figures for the rest of Europe? It would make interesting reading. Anybody who read this earlier on today will now be blinking and asking themselves if they had read the number of AKC champions wrong because “didn’t it say…..” Yes it did but Monique forgot to take her socks off when counting all the American Champions so got a little cross eyed with the number of times she had used her fingers. She suddenly thought she may have and counted up with fingers AND toes….hence the reduction to 73. Still a WOW of a figure! ……..and despite huge temptation the matter in hand will still be given well deserved priority. 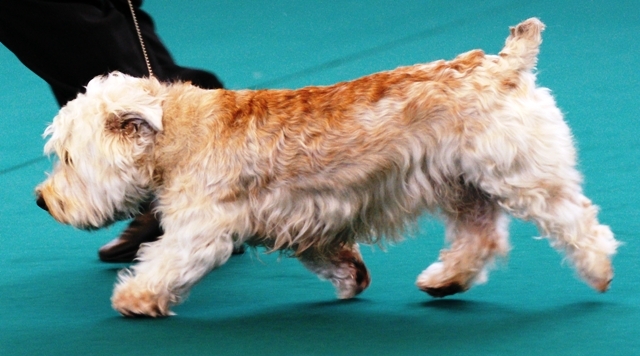 In a reverse of yesterday Belgian Champion Brenna Anne adds Dutch Champion to her list and Brenn is another Glen of Imaal Terrier that illustrates how well the veterans in the breed can do! This is the temptation; the report from CAWC. A “nice” week planned of just doing Glen things with no politics and this appears. Have a look at http://www.dogworld.co.uk/News/48-reduced-breeds for the easier to read version (not so long). How do you see the future of Glens after that? A breed with many acknowledged bar-sinisters so it should be alright or an achondraplasic breed with a known genetic problem? Exactly!! The International Week idea might work because another Glen of Imaal Terrier recently added another Championship outside their own resident country. Dutch Champion WannaBe Buster can now add Belgian to the list. Anybody volunteering a Glen, or any international news, for day three? How about an International week? Back to the grindstone after an international break so how about a week of international news? It is well known that some judges are fully paid up members of the international gravy train and none more so than Sean Delmar, president of the Irish Kennel Club. Last week he was judging in Puerto Rico and he must have been really gob-smacked to actually encounter a Glen of Imaal Terrier. Fiona (Am Ch Fiona The Wicked) made the trip South and went home with a Puerto Rican and Pan American Championship PLUS a Group 3. Does this make her the first American bred Glen to get a Group Placement under FCI rules? It’ll be back on the 25th November, refreshed and sober, but obviously its mail box will still be open for any news so don’t let it down!